My Paintings: Pam Dawber – Nerdwatch! 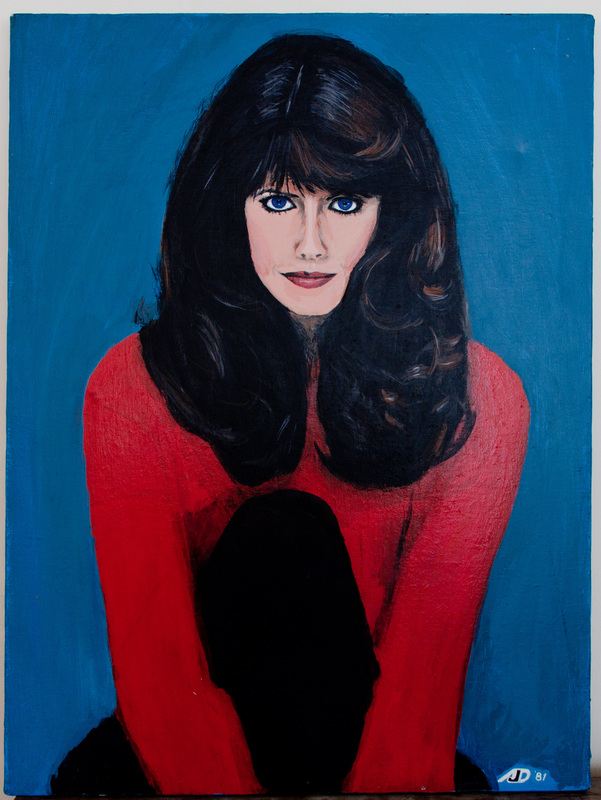 Well, this one takes me back, this painting is the very first one I ever did of a real person, Pam Dawber of “Mork and Mindy” fame. I had a serious crush on her in college, and when I saw the TV Guide cover with this photo on it, I had to try to copy it. Since at the time I was re-doing science fiction-based paintings, copied from book covers and others, I thought “why not try the same process with a photo of a person”, especially if I could make a poster-sized painting of someone like Ms. Dawber. Since it was my first painting of a person, I struggled to get a good match for skin tones. I finally found that using “Burnt Umber” and “Titanium White” with varying amounts of “Cadmium Red” mixed in I could duplicate almost all the skin tones I saw in photos. The nice thing about the original photo, there was very little detail from her clothes and background to distract from her face, and so I could spend all my time studying it. I guess that’s another reason I was so selective in who I painted, I needed to be able to stare at her face for hours on end, and it’s easier with some women than others. I definitely would be much more embarrassed (oh hell, I’d be petrified!) if I tried the same with a live model, which is why I’ll never do so! Besides, once the camera has caught the perfect lighting, pose, etc. it would be nearly impossible to re-create it each time I needed to refer to it, so better to just “cheat” by painting from photo. At any rate, here is the very first person I ever painted. Tagged actress, beautiful women, beauty, model, Mork and Mindy, painting, Pam Dawber. Bookmark the permalink.